Both the cavea, the place where sate the spectators, and the orchestra, where the performances were played, were far hewn out in the natural rock. Cavea is constituted by 89 rows of seats that are separated by three concentric corridors -the diazomata- in four parts. Five radiating staircases separated the cavea in four sectors, the cunei (kerkides). The central cunei were hewn out in the rock, while these in the lower part of cavea were made of stone domos above landfill. The first row of seats –proedria- was reserved for officials. The theatre allocated a circular orchestra of 26.68 m. in diameter, which was surrounded by a gutter for the flow of rain waters. Limestone slabs shape on the floor of orchestra a circle, which is adjacent to two straight lines. This form refers probably in the provision of the chorus that was circular in the dithyramb and rectangular in the comedy and the tragedy. The access to the orchestra became from two corridors in the north and in the south, the parodoi. The cavea’s slope was supported by powerful retaining walls. An oblong space, the proscenium, with 20 columns in its facade was opened to the orchestra. Behind the proscenium was found the scene to which led two ramps. This space was used initially as background for the action of the actors, while here they also made their disguise. An underground passagethat led from the scene to the orchestra, the charoneia staircase, was used for the appearance of Charon. Behind the scene was existed a Dorian gallery with its facade in the east. The theatre allocated initially an entrance that was found in south-eastern of the scenic building. In the 100 AD. a second entrance was added with a ramp in north of this. During the first half of the 2nd century AD. (100-150 AD. 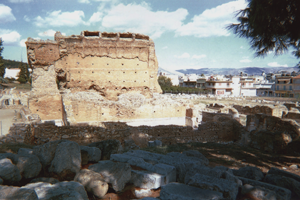 ), the scenic building of the theatre was reconstructed according to the roman models. The scene (postscaenium) was extended in length and in depth and it was acquired a monumental facade (scenae frons) that had three entrances. The new logeion (pulpitum) covered the eastern part of the orchestra and it was elongated up to the retaining walls of parodoi. The logeion’s face towards the orchestra was decorated with niches, while symmetrically in its two edges were founded the parascenia that were connected with the platform of logeion. Three staircases led from the scene to the logeion. Parallel to the two entrances in south-eastern of the scene which remained in use, a third entrance was shaped in the southern parodos for the access of spectators in the cavea. The hellenistic gallery in the east of the scene should be partly retained. After the introduction of new spectacles, such as the duels and the games with wild animals, a fence was constructed for the protection of the spectators, which was fixed in holes that were opened in the space of the orchestra. Other holes in the space of the cavea imply the placing of a shelter (velum) for the protection of the spectators from the sun. In the north of the central staircase was constructed a new platform for officials (proedria). During the 3rd century AD. the scenic building was embellished, while mosaic floors with geometrical decoration replaced the wooden floor in the edges of the scene. During the 4th century AD. in the theatre’s orchestra was constructed a tank that was used for sports in the water. A large gutter for draining water was starting from the southern parodos, it was going round the cavea in the level of the fourth step and it was suppling its reservoir from its northern edge. 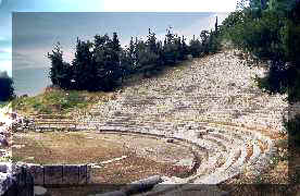 The theatre ceased functioning during the 5th - 6th century AD. but a great part of its cavea remained visible and it was depicted by the travellers who visited Argos during the 18th and 19th centuries. 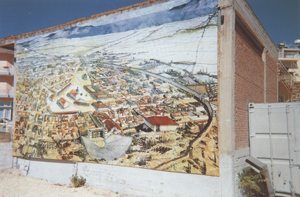 The excavations of the French Archaeological School uncovered the prominent monument of Argos. Roman Agora of Argos In the flat area east of the Larissa hill was founded the Agora, the centre of the public life of Argos city. The traveller Pausanias, who visited the city in the 2nd century AD., describes in every detail the monuments and the public buildings that adorned the site. A part of the ancient Agora was revealed during the excavations that are conducted by the French Archaeological School from 1952 up to now in collaboration with the D΄ Ephorate of Prehistoric and Classical Antiquities of Ministry of Culture. The configuration of the Agora was begun according to the philological testimonies and the discoveries of excavations during the 6th century and was completed at the end of the 4th century BC. The public character of the site was suppressed at the end of the 4th century AD. and the place of the splendid monuments was occupied progressively by private residences and workshops.